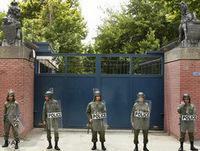 The European Union agreed on Sunday that intimidation and harassment of European diplomatic staff by Iran in Tehran would be met with a "strong and collective response." Speaking at an informal EU foreign ministers meeting, Czech Foreign Minister Jan Kohout, whose country currently holds the rotating EU presidency, called on Iranian authorities to release all embassy local staff. "We have made clear to Iranian authorities that the arrest and intimidation of foreign and Iranian staff working at EU embassies will me met with a strong and collective response," Kohout said. At least 25 people have been killed during crackdowns by Iranian police and religious militia in recent demonstrations which erupted over alleged vote rigging in Iran's June 12 presidential election. Kohout said that while the EU respected Iran's sovereignty it was concerned about the ongoing internal political crisis. "The EU strongly denounces arbitrary arrests and repression against members of the civil society...we call on authorities to stop the hostilities against EU member states and to release an EU journalist still in custody," he said. On Sunday, police arrested eight Iranians working for the British Embassy in Tehran, claiming they played a role in the post-election riots. British Foreign Secretary David Miliband said the ministers at a meeting on the Greek island of Corfu unanimously called for the immediate release of British embassy local staff detained by Iranian authorities. Iran has repeatedly accused Britain and the United States of stoking the unrest that swept the country after the June 12 election, which returned hardline President Mahmoud Ahmadinejad to power amid complaints or irregularities at the polls. The international community continues to voice alarm at the violent crackdown on opposition protesters in the election aftermath, but the Iranian government has hit back, accusing Western nations - particularly the United States, Britain, France and Germany - of meddling in the country's internal affairs. 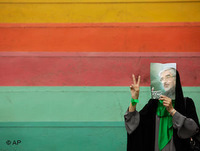 Mir Hossein Mousavi and Mehdi Karroubi, President Mahmoud Ahmadinejad's strongest rivals in the June 12 vote, have insisted that the election be annulled, while demanding an independent probe into allegations of fraud. 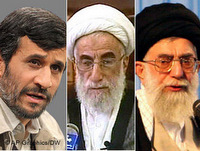 Iran's ruling clergy have declared Ahmadinejad the winner and ruled out holding a new election. The country's top electoral body, the Guardian Council, headed by Ahmed Jannati, has proposed a recount of ten percent of the ballots. Mousavi said on Sunday that "the most suitable solution to restore public confidence" would be a nullification of the results and a new round of polling. Karroubi has called for a panel to probe irregularities, saying "if an independent panel is set up by the Guardian Council with full responsibility to investigate all aspects of the election, I will welcome it and later nominate my representative." Meanwhile, the streets of the capital, Tehran, remain quiet with the country's supreme leader, Ayatollah Khamenei, warning that the authorities would suppress any further protests over the vote, which triggered the worst unrest since the 1979 Islamic revolution. At least 17 people have been killed in clashes with security forces and police have rounded up scores of reformist leaders, journalists and political activists.